In 1976 architect John Howard’s masterpiece, the original central building of the Queen Street mental health facility in Toronto — the old Provincial Lunatic Asylum, better known as 999 Queen Street West — was demolished. The Ministry of Health had decided the building, constructed in 1846-50, had to go. In the face of opposition by the City of Toronto and heritage groups across the province, and despite strenuous efforts by the new Ontario Heritage Foundation (beefed up with the passage of the Ontario Heritage Act the year before), the Ministry of Government Services, then responsible for the province’s realty management, proceeded to tear down the structure. When I started at the (then) Ministry of Culture and Recreation in early 1980 the wounds of this battle were no longer raw, but the reek of heritage catastrophe still lingered. 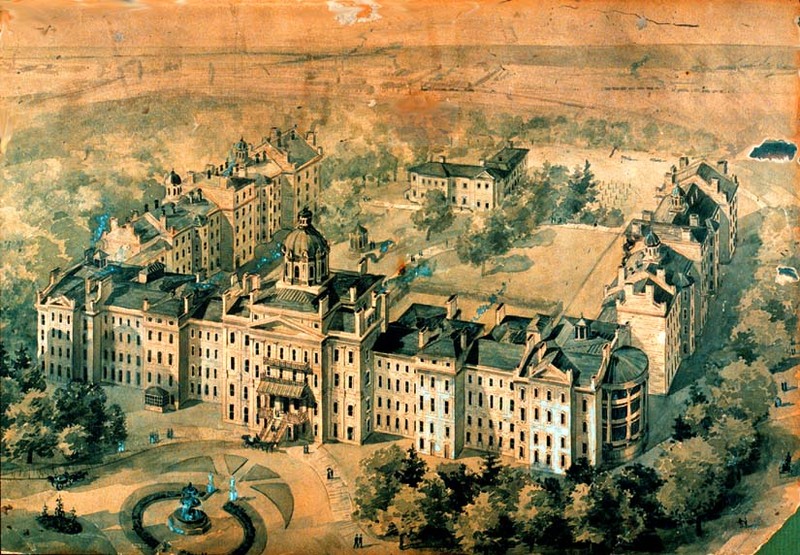 By the way, and as is often the case, it appears the huge controversy over the old asylum helped to preserve another Toronto landmark in provincial hands — the iconic Don Jail. When the jail’s future was threatened a year or so later, the government thought twice and ultimately decided to save the building. The experience with the Howard building highlighted a significant defect in the 1975 Ontario Heritage Act — there were no powers to designate or otherwise protect provincially owned properties. As noted previously (see “The Ontario Heritage Act at 40” from February 16, 2015), this was likely because lawmakers were wary of allowing municipalities, mere “creatures of the province”, to impose controls on government-owned assets. While other provincial laws — and indeed heritage legislation in other provinces — sometimes stipulated that “This statute binds the Crown”, meaning that provincial authorities would be subject to its controls, there was no such provision in the Ontario Heritage Act. Before 2005, what amounted to a huge loophole in our legislation — the Ontario government is the largest owner of cultural heritage property in the province — was partially addressed in two ways. First, the culture ministry in its various guises was able to negotiate, from the early 1980s, bilateral agreements with the Ministry of Government Services (MGS) and its successors charged with management of much government-owned land and buildings. The protocol with MGS required consultation with the culture ministry on decisions affecting MGS-owned heritage property. A similar agreement was developed with the Ministry of Transportation with respect to MOT heritage bridges. The protocols were periodically renewed and became more detailed over the years. While important steps forward, these arrangements were limited and lacked teeth. In 1990 A Strategy for Conserving Ontario’s Heritage — the “black baby book” I wrote about last time — recommended that the Government of Ontario “should lead by example through a co-ordinated, government-wide approach to the protection and use of Crown-owned resources” (page 43) and, under the goal of strengthening provincial leadership, set as an objective, “To develop policies and standards for the conservation of Crown-owned heritage resources" (page 57). Second, on the flimsy pretext that the Ontario Heritage Act did not expressly prohibit the designation of Crown property, a number of more venturesome (and frustrated) municipalities went ahead and designated buildings owned by the province under Part IV of the Act. These “designations” were usually tolerated — and ignored — by the provincial owner, but they did serve to send a message that provincial realty assets were also community heritage assets. Calls for the province to lead-by-example and “put its own house in order” only mounted over the years. For the culture ministry the policy question became not whether the government should respond to this pressure, but how. Note 1: From “Ontario Heritage Foundation History”, an undated and, as far as I know, unpublished manuscript by William Kilbourn, page 28. An interesting glimpse into Canadian politics and history I had no idea about. Thanks for including the image of the old building.